I usually write articles on topics that will give advice when it comes to health, fitness, and racing. I think this month I am going to mix it up a little bit and give you something a little more light-hearted. For those of you that have been following my writings and blogs, you already know that I have been playing sports for most of my life. Along the way I have picked up quite a few quirks. Now, I am not superstitious or believe in LUCK but throughout my years I have come up with things such as my Lucky USC Hat, a Lucky Chicago Bears Shirt, a Lucky 1880 Silver Dollar that was given to me to represent 100 years before I was born, a Lucky color orange, a Lucky number #17. I have even been known to throw items away that I believed were unlucky like my running gear I was wearing the day I rolled my ankle last year, and a random one not showering during finals week in college (I am not so sure that one actually worked). OK so maybe I am a bit superstitious and believe in LUCK but I know I am not the only one. So what is Superstition? The definition of superstition is “ the belief that certain events or things will bring good or bad luck”. By the definition, superstition and luck go hand in hand. So this phenomenom pertains to not only athletics and sports, but can also be relevant in our everyday lives. Luck is all around us, I would bet everyone at one point in their life has turned to an object, a routine, or article of clothing to help them through a rough patch or maybe even to continue on a streak of wonderful fortune and prosperous times. Can luck give us some sort of advantage when competing? I think luck gives us a sense of superpower or hidden energy. Our opponents don’t know it but we keep that bit of luck in our back pocket and use it when we need it the most. Perhaps in the late stages of a race, or when you step up to the plate in baseball, or even to overcome weaknesses. We use this as our Kryptonite, our secret weapon, our strength. For me, I use it to build my confidence and put myself in the right state of my mind while I am racing or while I am preparing to compete. It gives me a sense of comfort and consistency. Regardless of which race I show up at, or the conditions on race day, or even if circumstances that are out of my control, I trust and have the confidence that my LUCKY items will be there for me to help make everything right. Can luck really have a positive impact on our performance during events? I believe that if you believe it does it will. We often are looking for something to give us an advantage physically to make us stronger, faster, and smarter. The concept of luck might not make us physically stronger, faster, or smarter but it can give us a mental advantage which could translate into a better performance through confidence. The direct correlation between luck and confidence is the formula that will give you the edge to compete smarter, or push more, or go faster. Sometimes, keeping a positive outlook is all we need when entering the late stages of a race and I strongly believe that Good Luck Charms provide just that. Luck can be a powerful hand if you play it properly and truly believe in it. So in conclusion - YES!! If you think GOOD LUCK is a true phenomenon that could be the last piece of the puzzle to propel you past your competitors then go out there, find some LUCK, and use it to your advantage. GOOD LUCK in all your endeavors and I wish you the best!! On Race Day as I am preparing myself mentally and physically to take on the unknown of what the day might bring, I always think back and ask myself - "How did I get to this moment?". For me the start of the race is such an exciting time - the buzz is flying thick through the air, the adrenaline is pulsing as it flows through your veins, I can feel the electricity of excitement and the anxiousness of nerves in the air. Its time to put my body to the test as I push my limits and see how close I can get to the edge without going over. As I make my way to the start line my senses are always heightened. The colors are always so much brighter as I squint over the water to locate the buoys. The sounds are crisper as I can make out every huff and puff of breath from fellow competitors as they battle through conflicting emotions such as nervousness or "amped up" control. All of these emotions prepare them to get ready for the task at hand. I can feel the wind change as it blows across the back of my neck and across every hair on my arm. I can smell and almost taste that familiar smell of the rubber, from the hundreds, even thousands, of wetsuits and swim caps that surround me on all sides. The rubber combines with the smell of sunscreen which always reminds me of the long, hot, grueling road ahead of us as we seek our main objective for the day - the FINISH LINE!! As I dig my toes into the sand and feel every grain on the bottom of my feet and get that cool jolting sensation shooting up my legs from the water that has mixed with the sand, I hear the race announcer yell "5 more minutes!". With the countdown now in full swing, I pull down my tinted goggles and I escape/hide into my own little world. This is where the race starts for me. I take my position at the starting line right up front and take a look around at my fellow competitors and ask myself - "Did they sacrifice as much as I have to get here, to this moment? When they were totally exhausted did they get back up and say "just one more", like I did? Did they hit the snooze button when I was out there training? Did they quit when things didn't go their way, when I persevered and kept pushing? Do they look confident, as I know I am confident? Did they mentally prepare the way I did? I go through all these questions about my competitors and think to myself that the answer to all these questions is NO!! The race announcer says, "2 more minutes!" I ask myself - Do I belong here? Am I confident in all the facets of my training that has prepared me to perform well on this day? When times get tough and I face fear in the eye am I going to rise to the occasion? Am I going to give up and am I prepared to live with myself knowing I did? Did I exceed all my expectations leading up to this point? I am going dig deeper than the guy next to me? Am I ready to handle all the pain and suffering that today is going to bring? ABSOLUTELY!! NO QUESTION!! If I can honestly say that I know for a fact that most of my competitors will answer no to those questions and I can honestly say yes to all of mine I know I am going to have a great day. I must face the facts of my preparations and be completely honest with myself. ":30 seconds" Everything goes silent and chills of excitement race up my spine. Goosebumps shoot down my arms. GAME ON!! It is going to be a fun day and I'll see you at the finish line. This blog might seem out of place with our race seasons are so far in the distance, but I challenge you to look into this article a little bit deeper. All the questions referenced above we should be asking ourselves - now. This is the time we create all the answers for those questions. This is the time we compare ourselves to our competitors and use them as motivation to keep pushing, keep getting back up and keep putting one foot in front of the other. This is the time we hold ourselves accountable for the way we are training, the intensity at which we are training, and the focus we have for our goals. This is a critical part of training, so take it seriously so that you can carry yourself with the confidence of a champion when you start your race season. Train Hard, Train Smart, and Have Fun. I recently raced my first full marathon. I have done three marathons in the Ironman distance races after a 112 mile bike and a 2.4 mile swim - but never solo. So, I was anxious to see how it was going to unfold. Let's just say it didn't unfold like I had planned it; which happens sometimes for whatever reason on any given day. I felt as though I did everything wrong and nothing right. I paced wrong, I hydrated wrong, I think mentally I was a little absent, and, possibly, was over confident. So after the race the question became - What the heck happened? Did I do anything right? I must be able to find something positive, right? Then the icing on the cake - I had someone approach me and ask "so are you done racing marathons?" The question struck me at first as odd, but then I thought should I stop after only trying it once? After quickly analyzing the question I shot back and said "No way I am not ending on that note." That is all fine and dandy to not want to end on a "bad note" but I guess the question then becomes - What have I learned from this not so stellar performance? I knew one thing I needed to do, and I needed to do it quick. Figure out the answer to that last question. But how do we learn anything from such negative experience? Answer - Analyze it!! I am going to analyze every aspect of the race and learn as much as I can about the way I reacted to the event, my body, my mental outlook, my preparation, and my nutrition. This is the positive that comes from this scenario - learning from the negative. I needed to turn this big negative into as big of a positive as I can so I don't make the same mistakes again. The worst thing that can happen to us as athletes is to let the same things happen to us race after race after race. We need to constantly be changing our approach and learning from these mistakes. I analyzed this race up and down and learned a lot of valuable information about the day. Most were very obvious points and some I needed to go digging for. I really put myself back into that race - even though I mentally didn't want to experience it again. I found that I wasn't as consistent as I should of been when hydrating and fueling on the course. I got stubborn and just turned a blind eye to this aspect. Probably one of the biggest things I learned is - don't underestimate a race! I believe in the back of my mind I was overly confident thinking that this might be a walk in the park since I have completed this distance before in an Ironman event. Running this race solo is a whole different animal - lesson learned. Respect the distance ALWAYS. But with all that negative I did find one positive, no matter how bad it got out there on the course, even with my whole bottom half of my body seizing with cramps as I made every step, I was resilient and never gave up. I kept pushing forward even though my body was rejecting every step and my mind was telling me to shut it down, I finished. Maybe not the way I wanted to but I did cross that line. There were many more lessons learned that day but these were just a couple of them. So, if you have a bad race or training session I challenge you to analyze that session so it doesn't happen again. What you learn can be one of your biggest tools in your racing tool box and your biggest confidence booster as you move forward. All of this analysis produced a light bulb moment for me - can this analysis approach apply to a positive racing scenario? Answer - ABSOLUTELY. Sometimes we overlook all the information we can learn from a positive session, when in reality we should be asking ourselves almost the same questions. Why did my nutrition work this time? What did I differently? How did I fuel the night before my long workout session the night before? All these are just some of the questions we need to ask ourselves after a positive experience. After a positive performance we need to analyze for one major reason and that is to make sure we follow this information when we race to ensure that same positive outcome. My final point, in regards to the analysis process, is for all the times we are outside of a race. Frequently I am asked "What do you think about when you're training for such long hours?" I don't take offense to it when it comes from someone outside the sport because they perhaps don't understand the sport, but when it comes from a fellow endurance athlete it makes me concerned for them. For me, you guessed it, I analyze and assess frequently during my long training sessions. No matter what the distance is that we might be training for, I think we should constantly be analyzing and assessing everything going on with our bodies, our minds, different stress variables, the environment, our hydration, our fueling, our equipment, our competitors, EVERYTHING. We need to keep ourselves in constant check with how we are holding up as conditions and circumstances change around us. This will allow you to understand your body inside and out. It will allow you to understand how your body might react to almost every situation or stress you might throw at it and, if need be, how to get yourself out of certain situations. This self analysis should be happening regardless of the distance you are covering or the intensity of the session. The stresses and effects on the body are definitely different with the distances, so this just allows you a different opportunity to gain more information with different variables which you can then use to your advantage. You never want to be guessing on race day, so the more information you have going into a certain situation the more likely it will become a positive outcome. So if you have a productive training session, outstanding race or one that you might want to forget about; I encourage you to analyze it and learn as much about that experience as you possibly can and take it with you to your next race or training session. One final thought before I end this blog, athletics teaches us aspects about ourselves that we can implement into our everyday lives. This holds true for self analysis, we can use what we just learned to improve ourselves beyond belief as people, as employees, as employers, as spouses and the list goes on and on. So, I challenge you to not simply go through the motions, I challenge you to analyze, assess, and reassess what your body is doing and why, to help you reach your full potential on and off the course. "Your Child's Best Role Model Is You"
"My Father with My Son"
I remember growing up idolizing prominent figures: baseball player (and former IronPigs Manager) Ryne Sandberg , Michael Jordan, Lance Armstrong, and the likes. I was enamored by their abilities, their passion, and their determination to be the best at what they did – they were Super Gods! They were untouchable, invincible, and everything I dreamed of being one day. In retrospect, through my present adult eyes, I now realize that there are positive and negative elements of your role model selections in your youth. You take a gamble with your selection because there is no way to truly know these individuals on a “to the core” basis. Some will have a fall from grace and with that crashing fall comes a certain confusion in a young mind. Children don’t know how to process what happens in a scandal of epic proportions. Yet, some of the role models of my youth did continue to lead productive, positive journeys through their careers and some of them I still hold in high regard to this day. Another aspect I think we lose sight of when acquiring role models is the lack of a reciprocal relationship. You place so much pride, investment, and trust in someone who doesn’t even know you exist. There was one role model, however, that sticks out in my mind as soaring above the rest. I truly admired and looked up to this individual starting at very young age. And, honestly, I might not have realized it at the time, but my biggest role model was - my Father. He didn’t have all the “bling”, the fancy cars, the loud flamboyant demeanor of superstar role model but he did possess one trait that was parallel to the idols mentioned above - he was passionate about what he did. He wanted to be the best he could possibly be and continues to strive to be the best. I admire him for that. But there was one other thing he did that the others didn’t and really made him special in my eyes, and I believe this is what makes a true role model. He invested his time into me and our family. What is my one word of advice to all the adults out there who want to be their child’s superstar role model? Invest your time! Investing time is the key to making our children look up to us as role models. Granted our role as parents is very complex, twisted, multifaceted, but the one as a role model cannot be overlooked. As my father did with me, we need to fully invest our quality time and energy back into our children because, at its essence, our actions and our love will transcend into the person they grow up to be. When investing this bonding time with our children, it is not just showing up at an event or listening to them with half an ear. We need to put them first and truly get to know them which, in turn, will allow them to really get to know us on a different level. To do this we can communicate with them on their level, allow them to see what we do at work, have them engage in activities we are passionate about, be optimistic, and take the time to answer their questions. This investment you make with them, showing them how you work mentally, physically, spiritually and even emotionally, will go a long way in developing their character, confidence, and personal drive. Time investment will show them how to become successful individuals just like ourselves. These bonding moments will also allow them to see that perhaps you are not perfect and that it is okay. Witnessing our failures and missteps will show them how to overcome adversity and how to adjust their goals in order to succeed. The time investment is priceless and invaluable as they continue their journey of life. When we invest this time back into our children’s lives they will invest with you. As we make the investment we need to make sure we lead by example and instill in them the confidence to stay true to their moral compass. We need to show them how to become strong and love themselves for who they are. I strongly believe that our children do look up to us but it won’t be until later that they will really admit it. We need to set the precedent for our young minds of the future, as we set the bar high for them, and lead them to success. I challenge all of the parents out there to play an even bigger role in their child’s life, regardless of age, and to make a positive impact on their child’s life. We must remember that kids will then emulate everything that we do. We must be cautious in our mannerisms, tendencies, tones, sternness and approach of a balanced life. We must set great examples to make great individuals. Let’s go out there and help our little futures become the greatest individuals by investing the time that will allow your relationship to flourish into far beyond the reaches of “parent” and into the realm of Gods. Be their role model and you never know, they may put a poster of you on their wall one day! Remember the days of sweating in the sun as you chased a ball around the field, or tried to hit a ball over the fence, or maybe even tried to see how fast you could run around a track filled with cinders and if you were lucky enough a track that might have been blacktopped? Ahhh, childhood memories! These days were filled with sweat, blood, sheer exhaustion, cramps, sometimes tears, laughter, fun, victories and losses. After the long days of competition, how were we rewarded? With SLICED ORANGES!! I remember looking into that big bowl trying to find the perfect juicy slice that was cut just right, that had few visible seeds (there weren’t seedless oranges yet), and that looked like it had nice juicy pulpy sections. My teammates and I would be like pigs around the trough at feeding time trying to locate that perfect slice. We would sink our teeth into that juicy pulp while recapping the day’s event. As we looked around, you would notice the juice dripping down a teammate’s chin as they would smear it across their jersey. As they wiped their chin, the natural sugars from the orange juice would take hold in between their fingers that would make them stick together. That pure fruit juice would reinvigorate our systems. As I am now an adult and attend my child’s sporting events, I started to think - Where are the Oranges? Our kids are still putting out top notch performances just like we used some 20-30 years ago but after the events they are now rewarded with salty chips, cookies, and candy. The natural sugars from the oranges that made our fingers and chins so sticky are now replaced with the stickiness of marshmallows, frosting, and chocolate. The natural juices from the oranges have been replaced with sugary fruit drinks. As I look out across the field, court, or pitch, I don’t see much in the form of healthy nutrition being supplied to our young aspiring athletes. If I am lucky, I see a bottle of spring water basking in the sun as it sits by its lonesome waiting to be drank; but it is usually overlooked for a sport drink. We spend so much time, energy, money, and effort to watch them succeed, to give them the best resources to compete on a high level but we place nutrition on the backburner. Not to mention, the efforts that our children are giving cannot be in vain in relation to the nutrition that we then give them after their efforts. Why does nutrition, more times than not, take a back seat. Let’s not short change our young athletes from a nutrition standpoint but educate them on healthy living. These benefits we can provide our children give them the ability to perform at their full potential. It starts with us. So let’s start one slice at a time and make our children’s nutrition a priority. 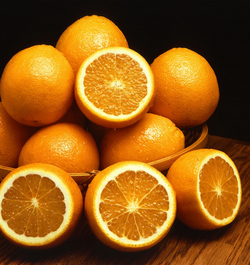 My challenge to everyone reading this – buy a huge bag of oranges, slice ‘em up, and tell those kids – dig in!! It is an often occurrence, that when someone encounters a health crisis, others are quick to say, “I can’t believe it happened to them, they take such good care of their body”. That may be the case, but how were they in the overall scale of being healthy. I see people working out like crazy people, only to get done and eat poorly or not get enough sleep to help the body repair itself. It is important to cover as many of the above stated issues in order to stay or start being healthy in totality. Remember being healthy is a lifestyle and constantly needs to be tended to. Listen to your body and it will tell you what it needs. Remember to live a life of moderation and balance and you will reap the benefits. Don't Lose Your Race Before You Race!!! All our hard work is in, we've spent countless hours training, sweating, and watching our nutrition. Our alarm clocks have gone off so many times pre-dawn, that sleeping in is waking up at 5:30am. Ahh!!! We don't want all this sacrifice to go to waste by a few bad decisions, or miscalculations leading up to race day. Below are some tips/guidelines I use to make sure I am ready for race day. 2. CRAMMING: We don't want to be training hard or long right up to race day. This leads to fatigue and you will not have the energy to race up to your potential. The goal is to feel like our bodies are fresh and energized body going into race day. Those last ditch efforts will only hurt our performance not help. 3. SLEEP: A couple days before the big race, make sure you start (should be continuing) to get a good night's sleep. This allows your body to repair itself from hard training so it is ready for race day. Sleep is vital in muscle and joint recovery, can't emphasize enough how important a good night sleep is. 4. a. FUEL: Make sure you stick with safe foods the night before your race. I like to stick with bland, carb-rich foods. My traditional pre-race meal is pasta with red sauce and grilled chicken. Stay away from spicy foods, alcohol, and soda. I would not try anything new either - which leads me to point five. Also the breakfast of our race day is very important, eat something light but enough to sustain yourself for most of your race (ie. greek yogurt with fruit, hard boiled eggs, bagels, fruit, etc.) b. HYDRATING: One last point in fueling. Make sure you are hydrating properly the day before and the morning of your race. Conditions (heat, length of race, your personal sweat rate, etc.) will indicate how much you need to hydrate. Note: Please don't just hydrate with water, you need to fill your body up with all the vitamins it will need on race day so use some electrolyte drinks - GU Brew, Gatorade, NUUN. 5. NOTHING NEW: Whether it be new foods, shoes, goggles, etc. Whatever your sport is (running, triathlon, cycling, etc) try as best as you can not to throw in new equipment on race day. This can lead to major problems, usually discomfort, which can lead to a miserable experience and sometimes to injury. I made this mistake in a race - I had thrown in a new pair of goggles for the swim leg of a triathlon and the goggles were much too tight and caused a lot of pain in my eyes during the swim. Be smart leading up to race day. Racing is hard, we don't want to add obstacles we can avoid. Race hard and have fun!! I went up to Lake Placid to train with friends over Memorial Day weekend and have some quality family time. It was the first time I had been back since last summer when I competed at Ironman last July. There were many moments while I was training that I thought about my race and what I was experiencing during certain segments of the race. Every time I look back, one of my favorite memories is the swim start. With new rules and concerns, Ironman is changing the start to this great race - one of the aspects of racing this great event I truly LOVE. There is something about treading water with about 3000 other athletes all ready to do battle and put their body through hell as we push it to the limit that is incomparable to anything else I've experienced. I am trying to understand Ironman's position but I am struggling to find their true reasoning and if this truly is a better way to go about it. 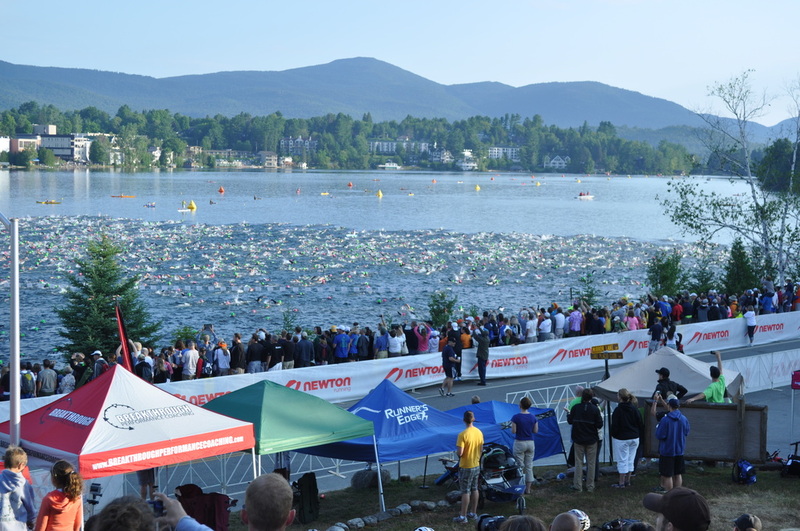 About a month ago, Ironman decided to implement a pilot program at Ironman Lake Placid 2013 where the swim start will be a wave start of self-seeded athletes and also switching the direction athletes are swimming (counter-clockwise as opposed to clockwwise). The waves will start at 6:30 and go to 7:00. What a GREAT feeling, can't explain it!! 1) Athletes will not have the opportunity to experience the mass start. I find this troubling for the athletes heading to Kona, that want to experience it and practice it before they head to the Ironman World Championships. I qualified last year for Kona in my first Ironman race at Lake Placid 2012 and was glad I experienced the mass start prior to going. I learned valuable information on how to start and how to tackle this aspect of the race and racing. 2) The self-seeded wave start - I believe that is what Lake Placid 2012 was. You self-seeded yourself in the water and I am not sure that that worked. You had athletes that thought their abilities were greater than they actually were and didn't want to be penalized by starting further back on the bike (especially the strong cyclists). In all these races as long as it is self seed you will have athletes that can't seed themselves. 3) If you think you might have a problem with the swim, then move back from the start line or wait a few seconds after the gun goes off before you start your race. It seems pretty simple. 4) You truly will not be racing the other athletes anymore, you are racing the clock. Before: every position you gained or lost - you gained or lost. Now: you have no idea where you stand when you pass someone or someone passes you, since you have no idea when they started. This is very discouraging, if you ask me. I personally like to know where I am on the course when I am racing. 5) Now my major issue. A lot of strong swimmers finish under 1 hr. So that makes their first loop split, roughly around 30 minutes which coincidentally coincides with the last waves being started (7:00). So as a strong swimmer or possibble Kona bound athlete, you will have possibly two starts to swim through (your own at 6:30 and the one that leaves at 7:00). These strong swimmers will do anything to keep going, even if it means kicking and clawing. I think this is huge cause for concern for the weakest and usually the most anxious swimmers on the course. This could present a lot of problems and and raises a lot of red flags in my mind. I think if Ironman is truly concerned with this issue they would limit the race field size but lets be realistic it always comes back to money so that is not going to happen. They could always reduce the number of entrants and hold more events. Always an option. I think to keep the racing feel between all athletes (if this is the route they are going to go) the same you should send whole divisions out in waves like all the other distances do. I really don't like what Ironman has done with the swim start and hope it changes back to the old for 2014. It will be interesting. What does everyone else think about Ironman's decision? I ordered this wetsuit from PX Triathlon – www.PXTriathlon.com – because of our cold conditions we have been having here in the Northeast. Winter just won’t leave, which left me worried about the water temps in my early season triathlons. I went up to Lake Placid to try it out in some very chilly conditions. I went up for a triathlon training camp with some good friends for the Memorial Day Holiday and wouldn’t you know it, it started snowing while we were there. So I thought the conditions should be perfect to try out my new HUUB Full Wetsuit Aerious 4.4, or maybe I have a touch of the crazy bug. Probably a little bit of both. I ordered the Small Tall (SMT), I am 175lbs and 6’2” tall. I was right on the upper end of the size chart which I thought would be perfect, nice and snug. I ordered it and PX Triathlon had it to me in 2 days, perfect!! I pulled it out of the box like a kid on Christmas morning and I thought I had ordered the wrong one, I wasn’t sure if it would my 8 year old daughter. I thought I might as well try it on before sending it back and getting the next size up. I wiggled a bit and worked it up my body and got it on. It felt nice and snug with no air pockets what so ever. It felt great, guess I won’t be sending it back. Test day in Lake Placid. I walked up to the beach in Lake Placid contemplating if I should go in or not, and looked out over the empty chilly lake with the top of the water looking like glass, and decided to suit up. I wiggled and squirmed again but not as much this time. It felt nice and snug, kind of felt like my skin. The wetsuit material was stretchy, and conformed perfectly to my body type. I felt the sand between my toes as I pulled my TYR Velocity Goggles over my eyes and dove into the shallows of Mirror Lake. The first sensation as the High 50 degree water temp hit my face was man this is crazy. I took about twenty strokes and got myself into a rhythm and started to evaluate my new wetsuit. I felt the buoyancy effect right away as it popped my body right to the top of the water. Then I concentrated on feeling the arm restriction from the sleeves of the suit. As I rotated my arms around my shoulders I could not feel any restriction what so ever. I have more restriction in my ZOOT sleeveless than I do in this HUUB Wetsuit. The material is thin and flexible enough that it does not interfere with the swim stroke at all. It felt almost like I was swimming without a wetsuit, in terms of arm restriction. Very refreshing to feel like this when swimming long distances like in a Full Ironman. Then I finally realized I forgot to check how I felt temperature wise. Well I wasn’t frozen up to this point. Since the temperature didn’t cross my mind after the initial shock, it goes to show that even though the material feels thin, light, and has a high elasticity that it doesn’t comprise the temperature controlling nature of the wetsuit. I did not feel cold in the least and actually started breaking a sweat towards the end of my 25 minute swim. Finally I had to get this thing off of me. I raced up the beach as I would in a race and pealed it off my upper body with ease and then made quick work with my legs. It did take me a little longer to take it off my feet since the elasticity is very high but nothing that a big yank couldn’t take care of. This product , the HUUB Aerious 4.4 Full Wetsuit is a great product. I was very impressed with all the qualities of this wetsuit. I felt that the makers of this wetsuit really took their time doing their research, design, and constructing such a great product. I would recommend this product to all my fellow racers that want a quality product. The whole process from ordering it from PX Triathlon to trying the wetsuit out seemed flawless and close to perfection. I am up here in Lake Placid once again for a few days of training camp. I went for my first bike ride since I've been up here this morning. Started out gorgeous then quickly turned sloppy. The sun went in and then rains came. Started out drizzling then went to pelting rain drops - OUCH!! Didn't feel so good. This is the first time I have been back since racing here at Ironman Lake Placid 2012, and it is kind of surreal. Every turn I made while I was on the course, I kept thinking about that part of the race and how I was feeling at those particular moments. Looking back, I am still amazed at my effort that day and hopefully in 2014 I will be able to improve on those times. Training camp isn't going to be too intense for me this year as I am coming off Tri Columbia last week and heading to Rev3 Quassy next week. I am just trying to sharpen up my skills, put in some quality miles, and have fun with my family and with some really good friends.